This is one of the best products, low technology that is available to the fitness market. Trainers, Jiu-Jitsu, snowboarder's, skiers, sailors, triathletes and anyone who wants to increase there core balance and fitness need a Indo Balance Board. I tried one a couple years back in Ski Barn and thought it was great. Finally after a couple years I am getting one, I tried the easy way out using an old skateboard deck and a PVC pipe but I feel quality is worth the price. "Using the Indo Board for fun or as a serious workout helps develop balance, coordination, and increased leg strength, while enhancing the all important core fitness. It also improves motor skills making the Indo Board a great cross training tool!" If you have the $148 after shipping get one this is a must have in your fitness routine. 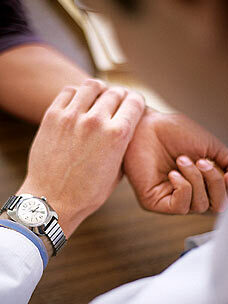 Implanted into your wrist for 24/7 monitoring of your blood pressure to reduce the risk of a heart attack and stroke. It is the size of a grain of rice and sits next to the artery in the wrist, and monitors the change in pressure. The trouble with test today is people get nervous when they see a doctor so when hooked up to the original cuff their pressure goes up a syndrome called "whitecoat hypertention". Also how often does one check their blood pressure even if they have had a stroke or heart attack. "Implanting a monitor that runs 24 hours a day could give a much more accurate reading. It will help doctors decide whether some patients need more drugs or whether they actually need less." This could be the start of people really being able to track statistics about their own health. Now if you are a triathlete or competitive swimmer you know the long hours and laps that you put in at the pool. If you are like me then you have always looked for a better solution to counting laps (having your buddy at the end of the pool with a lap board does not help). A couple years ago I found these goggles, the Inview that displayed lap count and time elapsed on their lenses so swimmers can track their progress. That was pretty cool for an invention, still has not hit the market, why not they would sell like hot cakes! Since the LifeStraw was first reported on, many have tried to get into the space of water purification in third world countries, but none seem to have what it took until now, WaterSheer is a new product that is a simple as putting it into a bottle and drinking. Like the LifeStraw (the name implies what to do), you fill a bottle and place the Sulis over the top and drink. • Low cost and efficient. • Durable, long shelf life and service life. • Treats most ground and fresh water sources.